Art Festival Week - Imagination is the name of the game during Hebron's Art Festival Week. The community conjures its creative juices, expressed through one-act plays, concerts, art shows and community art projects. Spirit Week - There is no limit to the silliness that ensues during Spirit Week, meant to invoke the Lumberjack in all of us. Each day a new "theme" is introduced, and students, teachers and staff find themselves twin hunting and dressed as inanimate objects. 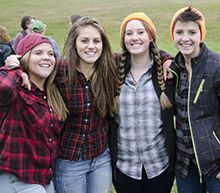 Lumberjack Day - Part of Spirit Week, on Lumberjack Day the Hebron community celebrates its Maine woods roots by donning flannels and fake facial hair while competing in log tossing, pancake and syrup eating competitions, "friend carrying races," and other Lumberjack shenanigans. Outing Club - Since the 1930s, Hebronians have been exploring the great outdoors throughout our 1,500 acres of Maine wilderness. Learn more on the Outdoor Education page. Halloween - Hebron faculty and staff don costumes, host a remarkably spooky haunted house, carve pumpkins and serve ghoul-icious culinary treats. Winter Carnival - Who said Maine winters aren't awesome? Since 1927, Hebron has been celebrating Vacationland's least forgiving season with dress-up days, a three-on-three basketball tournament, a broomball tournament, and snow competitions. Casino Night - A signature event of the Winter Carnival, students and faculty alike dress their best and ante up at Casino Night, followed by a formal dance. Concerts on Campus - these range from Cohen Chamber Music Series, to private concerts from artists like Suzy Bogguss. Off-campus Cultural Opportunities - Students have access to area culture - the Portland Symphony, Portland Stage Company, or Bates College lectures and concerts, and much more. Trips to Fairs - It's important to change up the scenery while still enjoy a good time, and local fairs and carnivals offer a terrific balance - bring on the Ferris Wheel and fried dough! 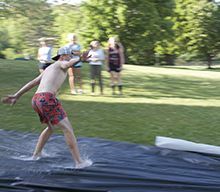 Slip-n-slide in the Bowl - Hebron's Bowl has served as a helicopter landing pad, playing fields, and come the warm weather it makes for a perfectly slippery slope to slide on. Spa Night (girls' dorm) - Hebron's female brigade enjoy mani-pedis and facials on Spa Night in Halford Hall - cucumber slices and pink Snuggies are encouraged. Poker & Video Game competitions - A dorm favorite, these tend to get pretty heated amongst the competitors, which include faculty, staff, and students alike. Valentine's Day Dinner - Hebron's dynamic faculty transform the Day Student Lounge into a high-class culinary establishment and serve top-notch nosh to student couples each Valentine's Day. Proceeds benefit Go! Malawi, a community outreach program located in M'Pamila Village, Malawi and led by husband and wife duo Mrs. Janet Littlefield and Mr. Bill Flynn, heads of Hebron's Academic Guidance Center. Snow Tubing - A snow tubing resort is just 20 minutes from the Hebron campus and offers endless wintry fun; if you can't beat the snow, you might as well join it! Cookouts - There's nothing better than an old-fashioned BBQ, which also doubles as a terrific opportunity for students and faculty to kick back together outside the classroom. Dances - Held regularly throughout the year and always memorable. Prom - Students gear up in their finest attire for this annual spring favorite. Spelling Bees - A perfect pairing of academia and genuine comedy, spelling bees are always a hit...and a great way for students to earn extra credit! Weekly Sit-Down Dinners - Each Thursday evening throughout the year boarding students and campus faculty dine together in a more formal setting while learning the value of decorum - Emily Post would be proud! Beat The Beard - A tradition that happens during Friday Morning Meeting, students challenge faculty to often humorous and interesting challenges. The Bridge/ GSTA (Gay-Straight-Trans Alliance) - The Bridge is an all-school organization that promotes equity among all members of the Hebron community, regardless of gender, race, religion, ethnic heritage, or sexual preference. The Bridge sponsors the Day of Silence each April and hosts events, meetings, and off-campus trips open to all throughout the year. Green Key - Since 1949, Hebron’s Green Keys have been the admissions ambassadors and tour guides who assist with special events throughout the year. All upper school students are eligible to participate; juniors and seniors are Green Key leaders. Chinese Club - The Chinese Club is run by Chinese-speaking students who wish to share their culture/language with the general student population. This group gets together for meetings, meals, and general fun activities. Math Team - Under the guidance of two faculty menbers and open to all students, the Math Team competes inter-scholastically and is active throughout the entire school year. Hebron mathletes have had strong success in state competitions and several team members have qualified to participate in national competitions. Student Government - Each year, every class elects officers. Officers lead the class in activities focusing on three goals: Spirit, Service, and Fundraising. All class officers meet monthly as a council to discuss their class progress towards achieving these goals. Funds raised are used for class activities and for the senior class gift. Traditionally, the senior class president delivers the commencement address. Outing Club - A part of Hebron’s Outdoor Education Program. 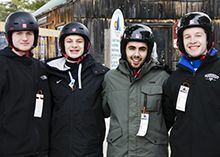 The Outing Club offers weekend off-campus trips to canoe, rock-climb, hike, snowshoe, and backcountry ski and ride. Trips are on Sundays and are open to all Hebron students. The Spectator - Hebron’s yearbook is developed by students under the tutelage of a faculty advisor. The group designs and compiles content for The Spectator. The Hebron Review - The Hebron Review is a student lead newspaper available online and print. Student Mentors - Volunteer students assist new or younger students as they navigate and aspire to success at the school.